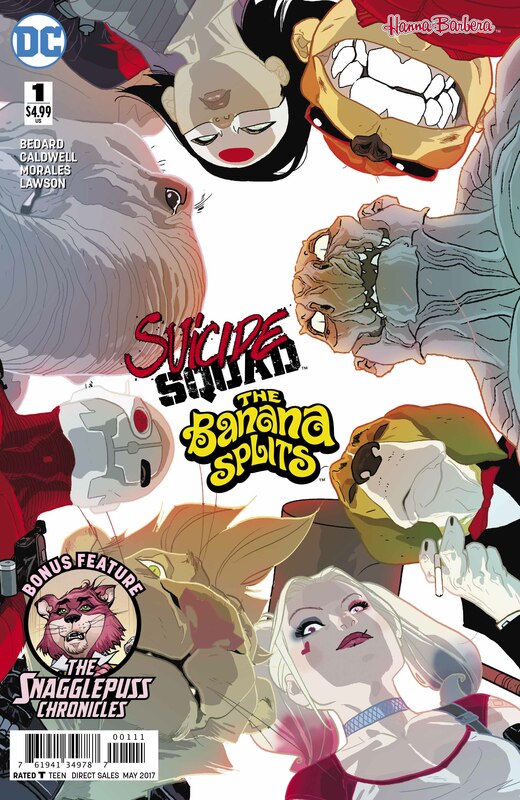 Suicide Squad/Banana Splits #1 is a surreal read, but comes with an excellent bonus story. 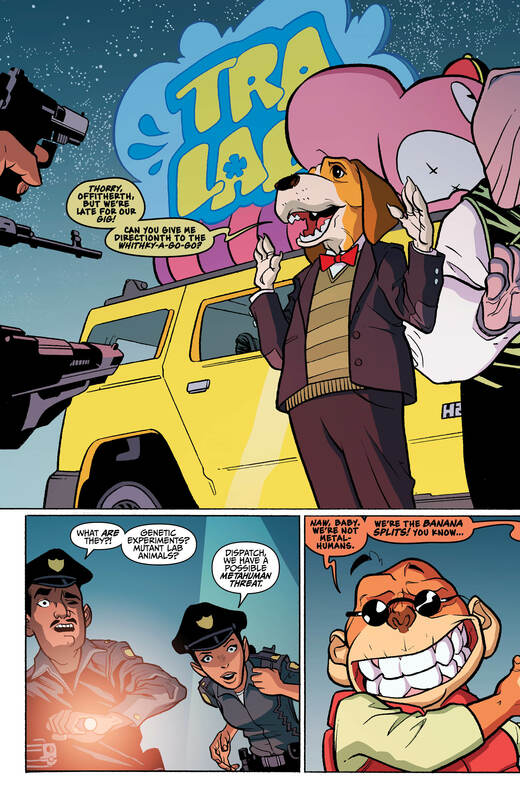 Full confession: Until I read this comic, I had never heard of Hanna-Barbera’s Banana Splits. According to Wikipedia, they were very popular in the 1960s, and Warner Bros. revived them on the Cartoon Network in 2008. Both date-ranges are perfect for missing me, and I also don’t get the impression they performed well internationally (I live in the UK). All in all, this seems like one franchise that was destined to forever avoid my attention. Until now, that is. 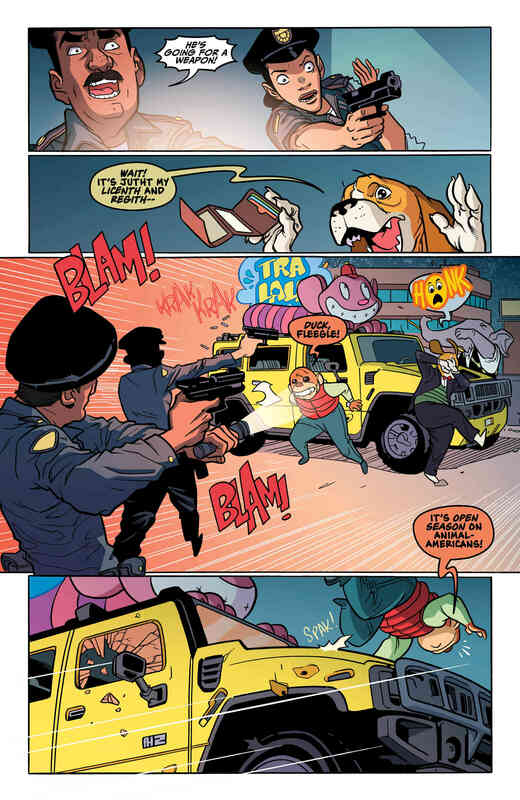 As part of DC’s ongoing series of comic book team-ups with Hanna-Barbera – the same push that gave you Scooby Apocalypse and Wacky Raceland – we’ve now been treated to what seems like the most bizarre idea yet: a (literal) band of anthropomorphized animals teaming up with DC’s own Suicide Squad. The idea seems frankly surreal, and to make matters worse for new readers, you’re assumed to be familiar with both groups. 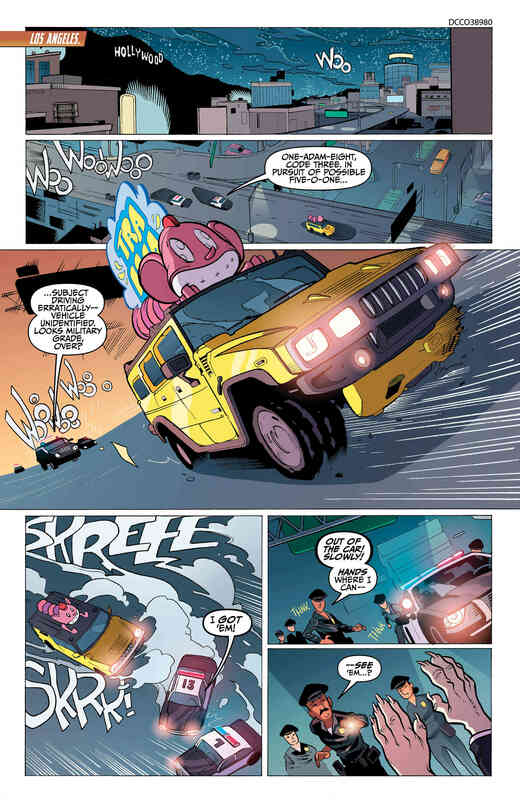 The story opens with the Banana Splits running into some trouble; they’re driving erratically, and wind up with the police pulling them over. One of them reaches inside his pocket to pull out his identification, and trigger-happy police open fire. 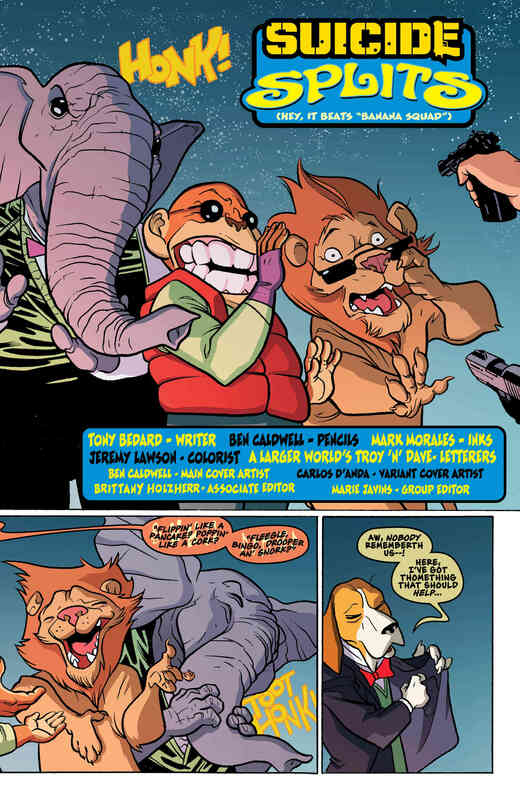 Soon, the Banana Splits are facing the inside of Belle Reve. 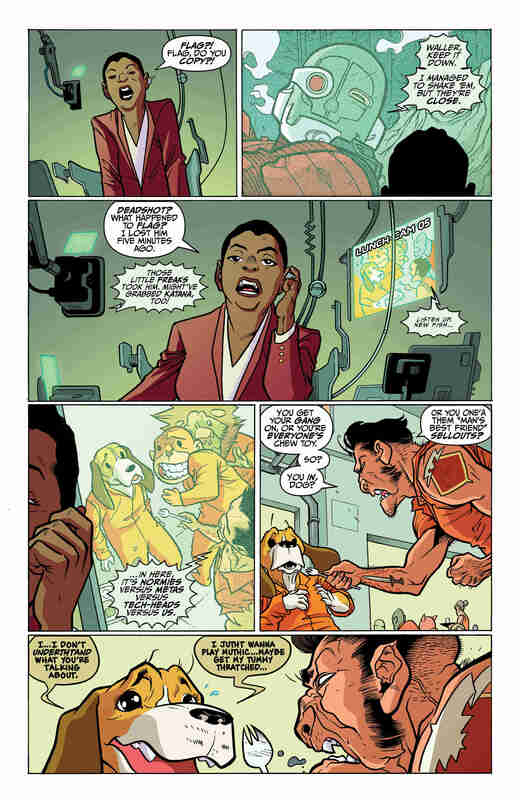 At the same time, Amanda Waller’s Suicide Squad are in serious trouble. She’s uncharacteristically desperate not to lose the current Task Force X, so doesn’t dare call in her other resources, as her bosses would work out what’s going on and trigger the brain-bombs. 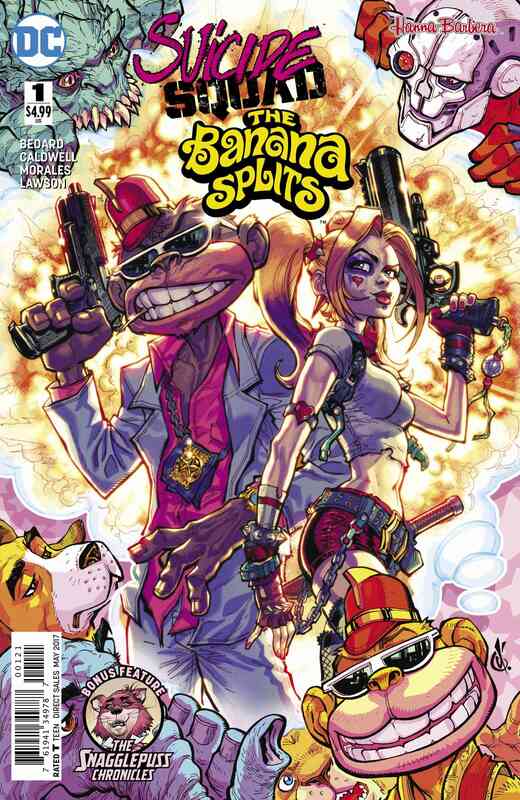 Instead, she spots the Banana Splits in Belle Reve, and suits them up as a next-gen Suicide Squad. 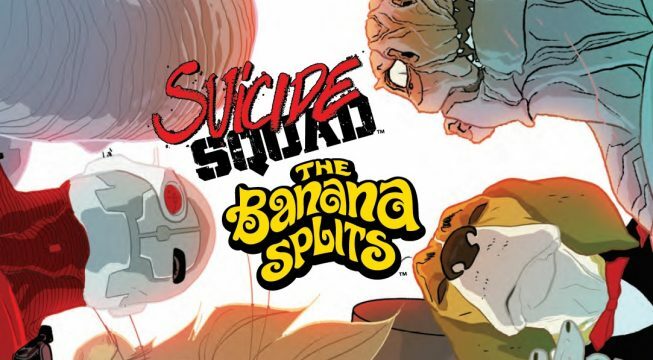 Tony Bedard does the best he can with an insane idea, and you can tell he has a blast; even the title page declares the story is called ‘Suicide Splits’, with a note of ‘Hey, it beats Banana Squad.’ Bedard manages to find the weird-and-wacky side of Suicide Squad, matching it up with Banana Splits as best he can; so you get Killer Croc comparing bubblegum to human flesh, or some genuinely funny moments with Harley. 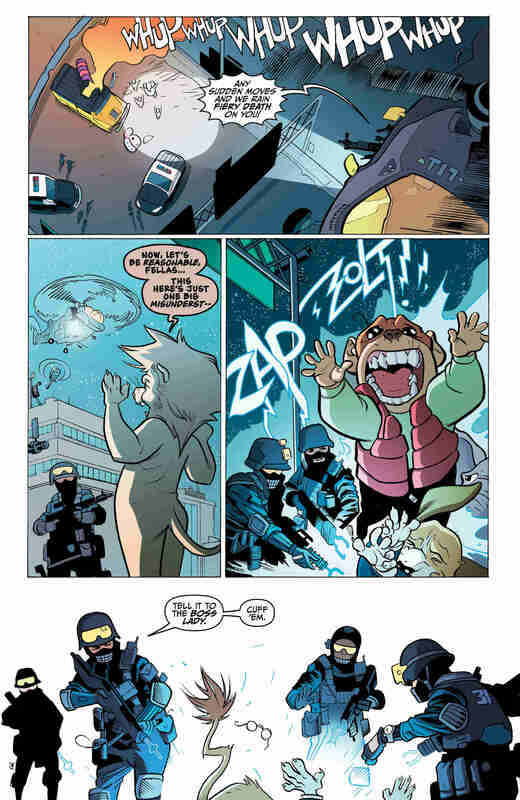 Don’t look to this comic for characterization; just head here expecting something very, very inconsequential. At the same time as being rather surreal, this story does actually have its high points. 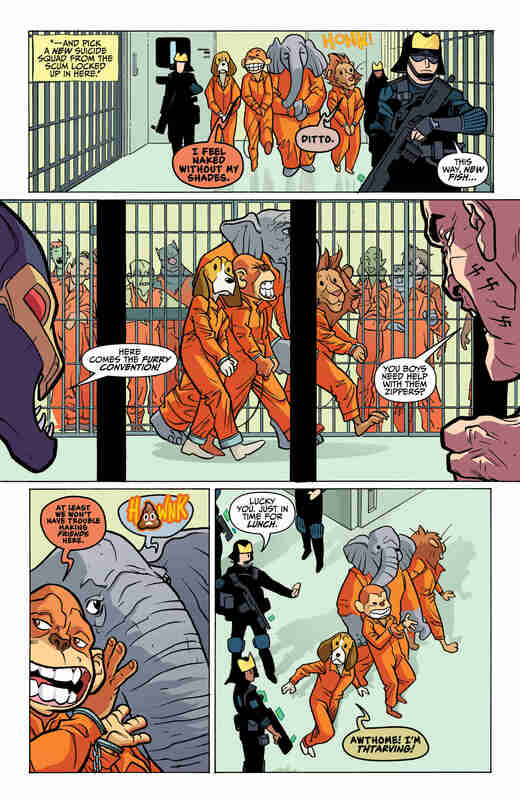 It picks up when the Banana Splits start to show just how powerful they can be; there’s a jail-fight that’s really fun. 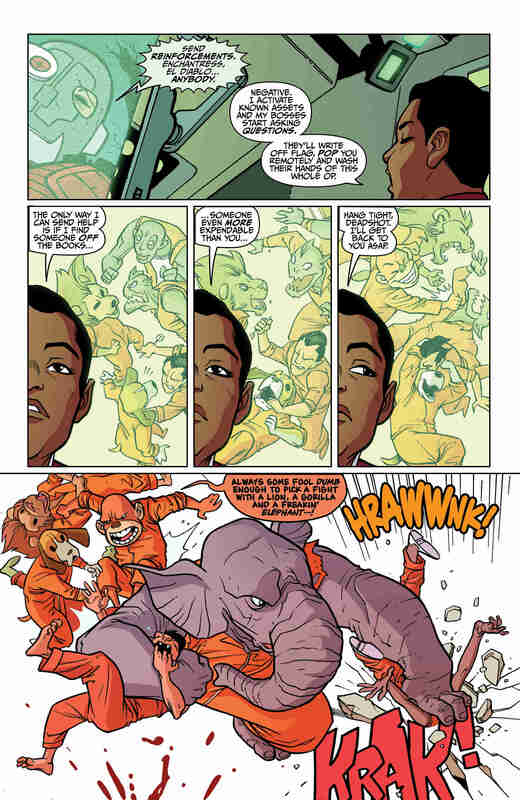 “Always some fool dumb enough to pick a fight with a lion, a gorilla, and a freakin’ elephant–!” At the same time, though, that scene just highlights the weirdness of this comic; tonally, we jump from what were clearly family-friendly characters to an elephant breaking another inmate’s spine. 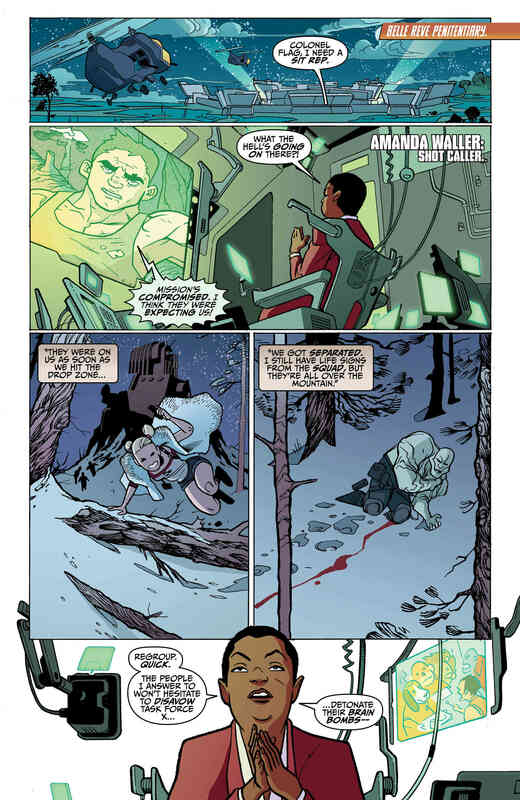 I will say, though, that Ben Caldwell’s art is perfect for this strange tale. He captures anthropomorphized animals so very effectively, and there are quite a few occasions where he essentially carries the story. 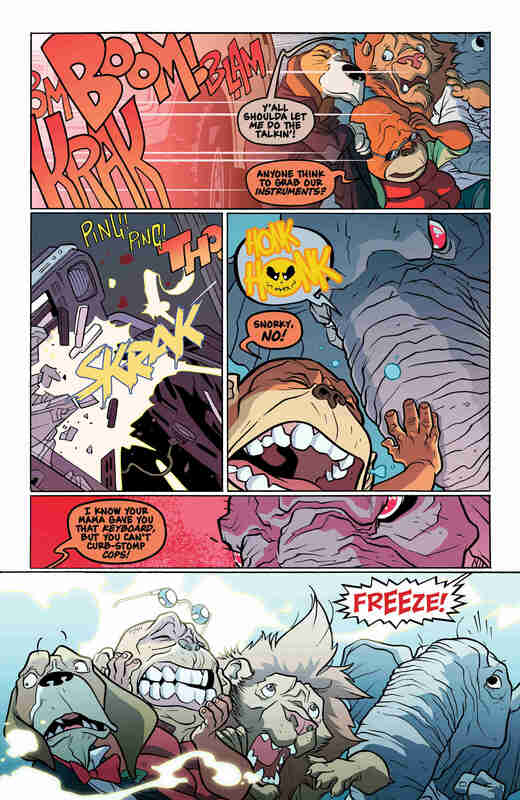 That said, there’s one additional feature; a short story featuring Snagglepuss. This character, at least, I’ve heard of, and I have to say that Mark Russell manages to put together a tremendous story centering on another fairly random character. 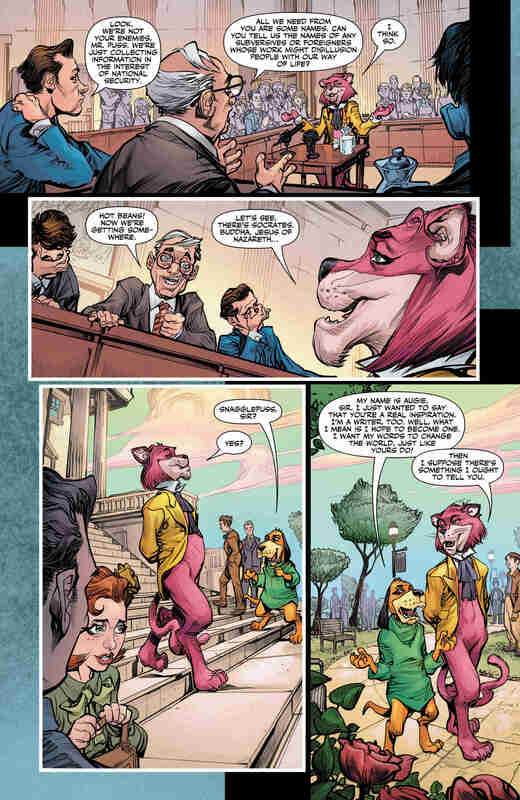 As a writer myself, I was drawn into Snagglepuss’s story, and I find myself actually strongly affected by the morals and the narrative. Oddly, I’d actually say this bonus story is probably worth the cover-price in itself. All in all, this is probably one of the strangest comics I’ve ever read. I’m sure those of you who are familiar with Banana Splits will find it much more exciting; for me, though, it was just a little over the line of ‘surreal’ for my taste. 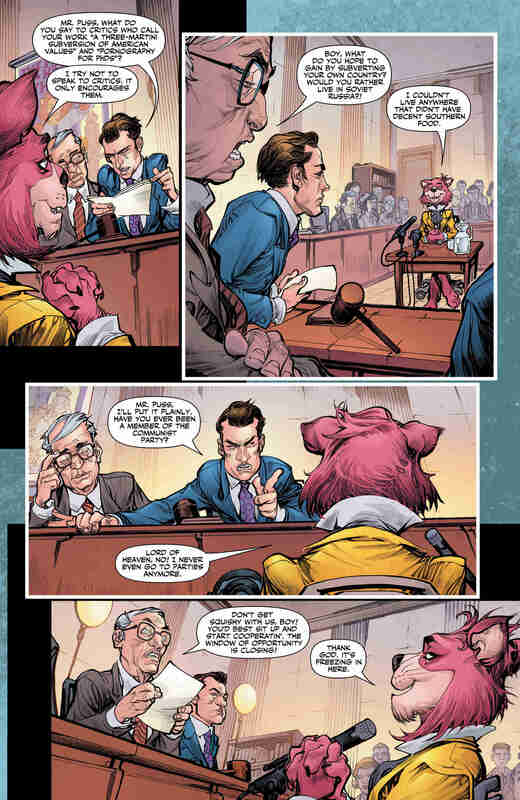 That said, the Snagglepuss story was exceptional.